I am Danni Rose, an author of swexy contemporary romance. If you want to know more about me or the stories I write, you’ve come to the right place. I’ve tried to create a website to tell you about myself, what I am writing, share some of the research I’ve done, and other topics you might enjoy. If you enjoy coffee and dessert check out the Coffee Shop page. There you will find recipes for yummy treats like those you’d find at Delectable Delights, the coffee shop in the Serenity Bay series, and Raison D’etre, the restaurant at the River Inn in Serenity Bay. 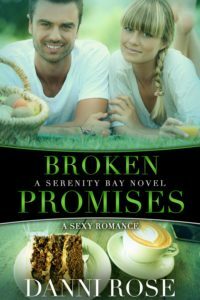 Book Four – BROKEN PROMISES – A full-length novel – Samantha Fleischer is searching for a place to rebuild her life. Jon “Erik” Erikkson has been betrayed too many times to risk being hurt again. When fate brings them together again, can they make room in their hearts for love and let their dreams come true? Book Three – PERFECT HARMONY – A novella – Stephen Howard, an attorney in Serenity Bay, and Harmony Owens, an escaped hippie from the sixties, clash over everything from her work at a New Age shop to his stubborn determination to send his sister to boarding school. Can two such different people find a way to trust each other and let love bloom? Book Two – DREAMS FOR TOMORROW – A novella – Mason Reed, owner & chef of the River Inn, and Amber Fuller, almost-accountant, need help to make their dreams come true. When they discover their dreams have changed, will they have the courage to change too? 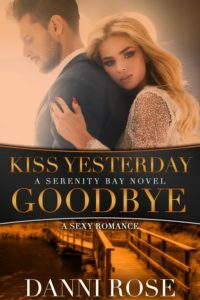 Book One – KISS YESTERDAY GOODBYE – A full-length novel – Jason Richards and Beth Kingsley fell in love as teenagers. But their dreams were shattered by lies and misunderstandings. Given a second chance at love, can they find the strength to let go of the past?